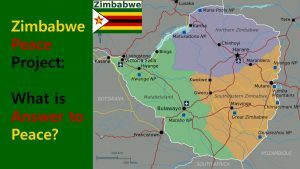 Zimbabwe Peace Project: What is Answer to Peace? Things not all that rosy in Zimbabwe. On 18 June 2017, in Ward 23, Chitungwiza Zanu PF youths allegedly assaulted MDC-T youths. The MDC-T youths were meeting at the home of Chitungwiza Deputy Organising Secretary of the Women’s Assembly, Anna Mutara when they were attacked. Tension is brewing, as it was in the past. From 12 December 1979 to 17 April 1980, Zimbabwe Rhodesia was again the British colony of Southern Rhodesia. The Rhodesian Bush War—also known as the Second Chimurenga or the Zimbabwe War of Liberation—was a civil war that took place from July 1964 to December 1979 in the unrecognised country of Rhodesia. On 18 April 1980, Southern Rhodesia became the independent Republic of Zimbabwe. Conflict today remains rooted in disputes over national power, economic hardship and pre-colonial disputes which have not been resolved. How does Zimbabwe, with its sad memory, maintain its peace? They know the value of peace more than anyone else. So, Zimbabwe Peace Project (ZPP) was established in 2000 by a group of non-governmental and church organisations. Since inception, ZPP has produced timely national monthly monitoring reports on violence and human rights violations. The VISION of ZPP is that ‘A Zimbabwe where there is Peace, Justice, Dignity and Development for all.’ Other peace organizations are the ‘African Union‘, ‘Silveria Hourse‘ and ‘Catholic Commission for Justice and Peace in Zimbabwe (CCJPZ).’ However someone is using war for their own benefit, there are many people who are trying to make peace. 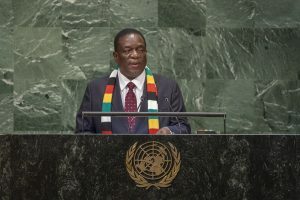 While President Emmerson Mnangagwa recently told the United Nations General Assembly, that he was ready to engage the opposition, for possible working together; on the ground, nothing seems to be happening. Apparently, opposition leader, Nelson Chamisa recently told a media briefing that prioritising nation and peace building is the prime ingredient for national prosperity. But critics say that their speeches were just words and the leaders have no real will. Zimbabweans are stressed, and things are not working out, most citizens have been calling on the national leaders to find the Answer to Peace. just as it has to promote peace. Today’s wars no longer occur in isolation within a state. ﻿ According to the Heavenly Culture, World Peace, Restoration of Light (HWPL), HWPL chairperson Man Hee Lee recently challenged journalists who are the custodians of information as peace messengers. He said the press should use the power of influence it has, to shape leaders’ perceptions. “If journalists dedicate themselves to peace building efforts, the thought of people especially politicians will change.” I think it is the Answer to Peace. “Peace Initiative” is a global journalist network in efforts of facilitating a culture of peace as contribution to conflict resolution and peace building through press freedom and freedom of information stipulated in the UN resolutions and international agreements. 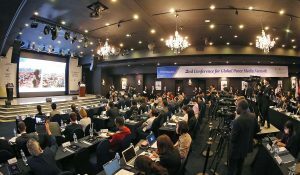 Individual journalists and media agencies affiliated with “Peace Initiative” dedicate to spreading news of peace to enhance human rights and protect democracy. Author masterPosted on 2018년 October 30일 Categories About me :)Tags 2018 HWPL World Peace WARP Summit, 918 WARP Summit, African Union, Answer to Peace, Catholic Commission for Justice and Peace in Zimbabwe, DPCW, Emmerson Mnangagwa, HWPL, Nelson Chamisa, Peace Initiative, Silveria Hourse, United Nations, United Nations General Assembly, Zimbabwe, Zimbabwe Peace Project, Zimbabwe Rhodesia, ZPP10 Comments on Zimbabwe Peace Project: What is Answer to Peace?